Know someone who absolutely adore minions? We have the perfect thing for you. Buy Mattel Mega Block Mega-Strax Minion’s Ninja Training 82 Piece FND 05 at Rs 414. Order now before the product goes out of stock. Hurry up. 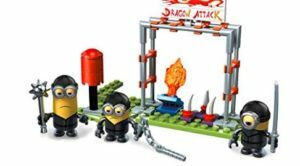 How to Buy Mattel Mega Block Mega-Strax Minion’s Ninja Training 82 Piece FND 05 at Rs 414?